This week USCIS fulfilled another of its 2014 goals to reform employment-based immigration for high-skilled employees. The Secretary of Homeland Security has designated as precedent the Administrative Appeals Office’s decision in Matter of Dhanasar, 26 I&N Dec. 884 (AAO 2016), Int. Dec. 3882 (December 27, 2016). Click here for USAIE’s response, and key points from this decision, in PDF format. Or, read on for our comments. Precedent decisions are binding on DHS employees in all future proceedings involving the same issue or issues. The original goal in 2014 was to clarify the criteria for qualifying for a green card in the national interest waiver (NIW) category. USAIE applauds DHS for this action. In particular, Dhanasar opens the NIW category to entrepreneurs. The decision is worth reading because it reviews the history of NIWs and what did and didn’t work in the past. NAFSA has provided a very useful extract of the relevant parts of the decision’s new three-prong “national interest” standard on the NAFSA website. 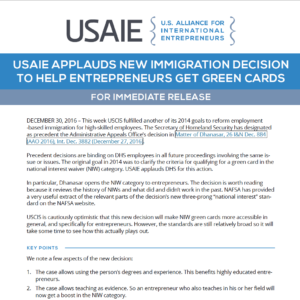 USCIS is cautiously optimistic that this new decision will make NIW green cards more accessible in general, and specifically for entrepreneurs. However, the standards are still relatively broad so it will take some time to see how this actually plays out. The case allows using the person’s degrees and experience. This benefits highly educated entrepreneurs. The case allows teaching as evidence. So an entrepreneur who also teaches in his or her field will now get a boost in the NIW category. The benefit to the U.S. interest can be local, such as helping to create jobs in a depressed area or creating a specialized local product. Entrepreneurs can argue the impact of their work on the economy, starting regionally, and then adding national supply chain implications if applicable. The decision also notes that the entrepreneurial venture does not need to succeed: “many innovations and entrepreneurial endeavors may ultimately fail, in whole or in part, despite an intelligent plan and competent execution. We do not, therefore, require petitioners to demonstrate that their endeavors are more likely than not to ultimately succeed.” The business just needs to be “well positioned to advance the proposed endeavor.” This stresses the importance of a high quality business plan for entrepreneur NIW cases. The decision requires an NIW applicant to show that it would be “impractical” to go through the normal labor certification process. Labor certification, or PERM as it is also called, is the most common form of employer-sponsored green card. But for entrepreneurs, it can be difficult because labor certification requires a full time job offer at a competitive salary and evidence that the company has the ability to pay that salary. As always, NIWs are a chance for creativity in showing a foreign national’s talents. USAIE members have been successful in representing NIW applicants in the past, and look forward to representing even more people using this new case. USAIE will share more about the new NIW standard as we see how USCIS interprets the new guidelines in specific cases in 2017. Contact info@usaie.org for more information or to see how you might qualify for an NIW green card. This entry was posted in Articles, News and tagged Immigration Law, Matter of Dhanasar, NIW, USCIS. Bookmark the permalink.